Mt. 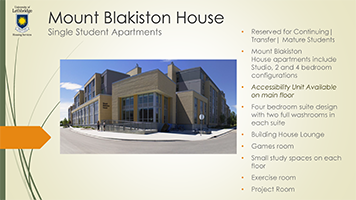 Blakiston House units are reserved for Continuing | Transfer | Mature Students. All bedrooms in Aperture Park are single occupancy. Students must be enrolled in full-time studies at all times (9 credits or more per term). Due to high demand, we are UNABLE to guarantee rooms to all applicants. 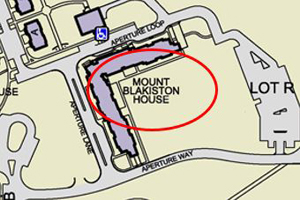 The newest residence complex in Aperture Park is south of Piikani House and Tsuut'ina House, and across from Residence Village and Paterson Centre. The facility will feature 259 beds in studio and four-bedroom configurations. All spaces have kitchens and double beds. 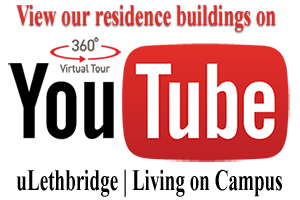 Several studio rooms are being designed for long term guests and visiting lecturers, there are several accessible suites, and a massive amount of social and study space on site. Controlling my thermostat in Mt Blakiston House!